A little black dress will always be a valuable wardrobe staple and this one from J.Jill gets extra points for comfortable jersey knit and a very flattering silhouette. J.Jill gave me this dress to review. All opinions are my own as always. Sale alert! J.Jill on sale right now … 30% off your entire order and free shipping!!! Made of rayon and Lyrca spandex knit, this soft comfortable J.Jill dress has just the right amount of stretch. And the draped front is a genius detail, perfectly hiding a little midlife belly. The three-quarter sleeves and knee length are perfect for all sorts of occasions, from work to date night to party time. I kept the accessories simple in this look. These black pumps have been in my wardrobe forever and I really need to replace them. The only reason I haven’t yet is because they are broken in and so comfortable! Do you have a classic high heel pump that is super comfortable? I’d love some suggestions! I’m using my Rebecca Minkoff crossbody bag. 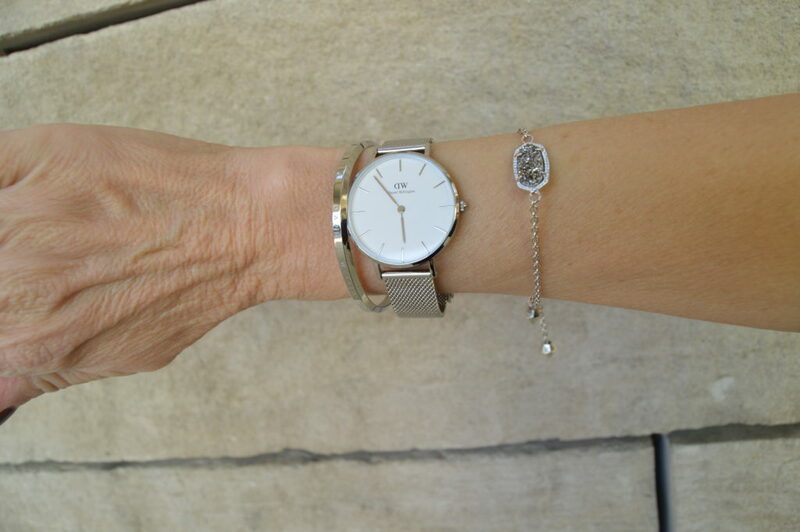 My silver jewelry is Kendra Scott mixed with my Daniel Wellington watch and cuff. Oh and I almost forgot, my current favorite easy way to elevate my look, fishnets! 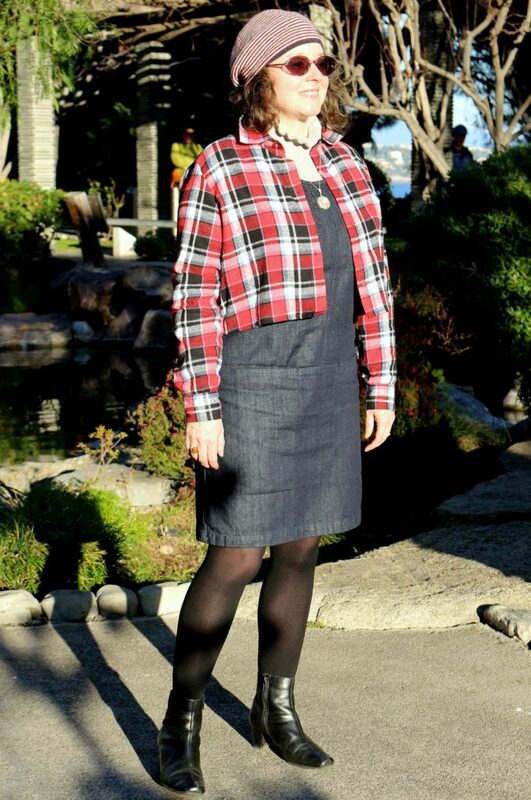 From last week’s link up, I’m loving this adorable chic look from Jacqueline of Petite Silver Vixen. I’m starting to get my holiday content posted, Dolls, including a party dress guide and hostess gifts. And don’t forget to keep checking back for more holiday style ideas, gift guides, and sales alerts! PS Be sure to link up! Wow, I really love that dress Dawn Lucy. The draping in front is great. Looks fabulous on you. This is such a great dress and the versatility of a LBD is such an asset. I love the way you styled it. Very elegant and classy. Spot on with the fishnets and black pumps! Never underestimate the power of a little black dress with all black accessories. You look radiant! Love the dress and accessories. That watch is gorgeous. Fantastic dress and great styling with those fishnet tights! Love how you took your LBD to the edge with those fishnet stockings! Gorgeous! In love with this LBD! It’s so elegant and classic and I adore the fishnets with it. Thanks for the link up! Love this dress with the fish net stockings! What a cute LBD! I love the waistline detail. A little black dress with a twist. I love it! That is a black dress to have! I can see it would be so versatile! Great post and happy Friday! Beautiful monochromatic look. The fishnets make this even more wonderful! Love this dress on you Dawn! The sleek styling, fit and silver accessories are beautiful. i am asking Santa for some Kendra Scott, love the bracelet. This is such a timeless, elegant dress! It looks fabulous on you! Fashion should be fun – and this most certainly is!!! LOVE! Love your LBD–always a classic! What a great little black dress! And styled with fishnets is the perfect touch. Great look! such a great little black dress! love the fishnets! Very chic LBD! I love the fishnets! Every girl needs a little black dress (especially for the holidays!). I love that this one has such gorgeous details, and that you paired it with those tights. I could definitely see myself wearing this.